When I started my first job out of college, I came across this book on an online article. Now just to preface, this was not my first real job, but it was the first job I was taking with a company I had not worked with during college. I was curious to learn what sort of tools and techniques the book offered. 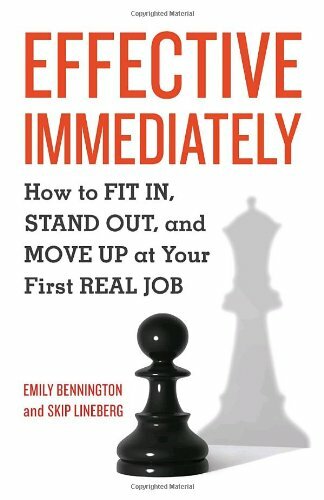 I found much of the advice to be pretty standard common sense, but I also found it could be a great resource for those who were going into a job for the first time as a professional. One of the nice aspects I liked was that this book had plenty of "Newbie to Newbie" segments with advice and experiences from first-time professionals. I decided to give some of the techniques a shot and put them to real practice. I employed things like following-up with my boss on my achievements, challenges, opportunities and upcoming schedule. Another technique I put to use was keeping an Excel spreadsheet where I logged all of my projects, major tasks and accomplishments with due dates and completion dates. I can't tell you how invaluable this was come performance review time! By keeping a log of your work it makes it easy to justify the "Exceeds" evaluation your boss gives you for the rock-star work you did all year! As the book suggests, it is also beneficial to become really good at a few skills your first year. This helps you focus on what you like and excel at and really develop these specific skills. You'll be surprised at how much more you will learn and retain by narrowing your focus on the skills you want to develop in your first year. "Effective Immediately" offers practical advice in areas such as email etiquette, how to deal with difficult colleagues and time management. It covers everything from what to expect on Day One to building your "career mojo". Other techniques for meetings and communication were also very useful. In fact, I felt that many of the tips could be applied by anyone, not just newbies. If you are just launching your career or know someone who is, I highly recommend "Effective Immediately". You'll learn helpful tips to get you off on the right foot for a successful career.